The latest project from Nintendo’s Entertainment Analysis and Development studio was demonstrated at E3 today. Managed by Shigeru Miyamoto, creator of Mario and Zelda, the team behind Wii Sports and Wii Play are now nearing completion of a musical instrument simulator for the Nintendo Wii Console, called Wii Music. With the aim of making it easy for everyone to play, Wii Music transforms the Wii Remote & Nunchuk controllers into more than 60 different instruments, including: violin, drums, guitar, etc. 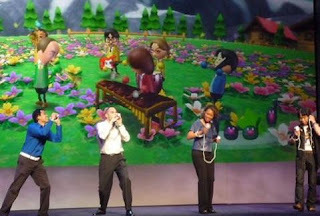 Players strum, drum and play along while Wii Music translates these movements into music, which Nintendo says: "always sounds great"